Well, isn’t this a pleasant surprise? After so many Nokia and Apple concepts here’s a device focused on the Google experience. 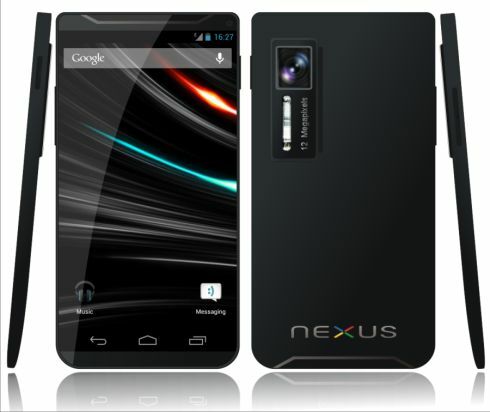 This is the Next Galaxy Nexus, or maybe you want to dub it Galaxy Nexus 2. I supposed it’s made by Samsung, since the designer didn’t mention that aspect, although some elements of its design make me think about Motorola. The Next Galaxy Nexus features a Super AMOLED display with 5 inch diagonal and 720p resolution, plus Corning Gorilla Glass 2 protection. Other specs include 32GB of storage, 8GB of RAM (?! ), HSDPA 42 Mbps connectivity, WiFi, Bluetooth 4.0, microUSB 2.0 with MHL and USB on the go. The camera at the back is a 12 megapixel sensor with autofocus, LED flash and simultaneous HD video and image recording, touch focus, image stabilization and face and smile detection. The device features a front 2 megapixel camera with 720p capture at 30 fps, while the camera at the back does 1080p video capture at 30 fps. The battery inside the Galaxy Nexus 2 is a 3200 mAh unit and the OS on board is Android 4.1.1 Jelly Bean. As the brain of the smartphone we have the quad core Nvidia Tegra 3 quad core 2 GHz processor, with GPU ULP GeForce. Killu-Chan did a great job with this design, that looks a bit more sci-fi than the curved Galaxy Nexus.